Mickey Mouse has a new clubhouse contrary to his typical housing accommodations: a design house. In fact, multiple design houses are bringing back the iconic Disney character in their newest collections due to ‘his’ 90th anniversary. From shoes to sweaters to candies, it’s safe to say that there’s no shame in embracing some 1920s Disney nostalgia. Read on to find out how brands are paying homage to the Mouse’s massive milestone. 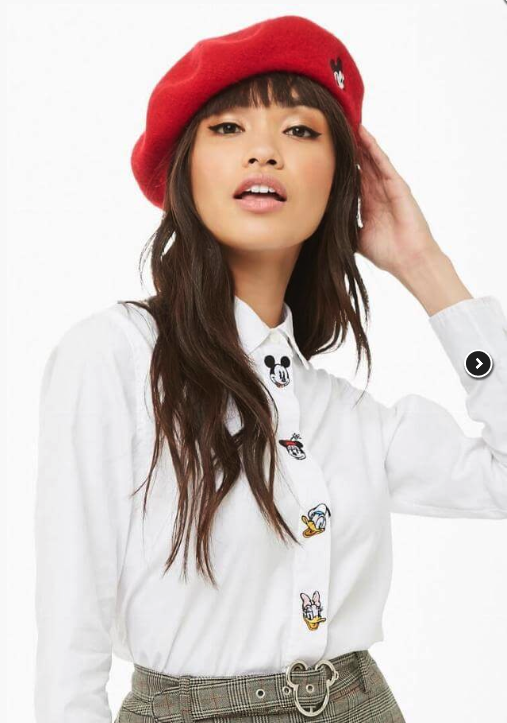 Clothing company Forever 21 recently created a “Mickey 90th Collection” exclusive to the anniversary celebration. 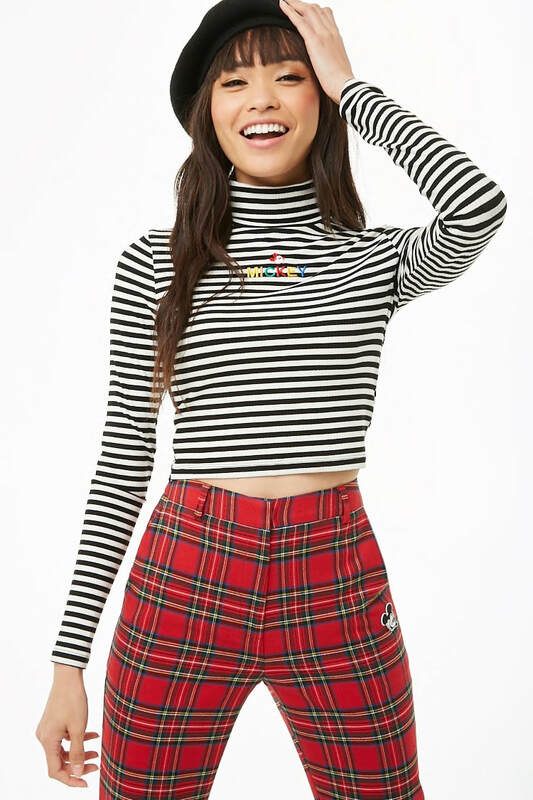 The line is filled with stripes, a red and black plaid pattern inspired by Mickey's outfit colors, and tons of miniature icons. The collared shirts in the collection are a definite standout; they have an old-fashioned feel, yet they look as fresh as ever. After previewing their Mickey-inspired capsule collection on the runway at Disneyland this past March (with ever-so-clever Mickey Mouse buns on models), Opening Ceremony is selling the clothing on their website for the public. 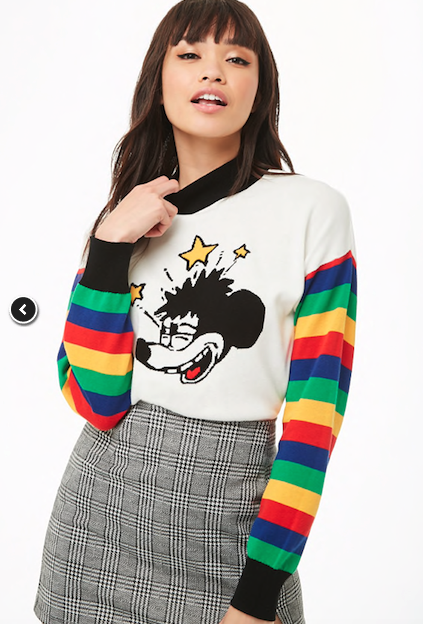 The design label took a more artistic approach in featuring the character by putting hand-drawn Mickey Mouse and logo prints--inspired by DIY craft--throughout the line. Vault by Vans is collaborating with four renowned artists--John Van Hamersveld, Mister Cartoon, Geoff McFetridge, and Taka Hayashi--to create custom artwork of Mickey Mouse on iconic Vans items. The drawings are placed on Vans’ classic shoe silhouette, OG Sk8-Hi LX high-top sneakers, and a short-sleeved tee. Each artist has something unique to offer to the collection: vibrant graphics for Hamersveld, blank ink tattooing for Mister Cartoon, bold minimalism for McFetridge, and a unique innovation for Hayashi. Luxury fashion brand Yves Saint Laurent joined the Mickey anniversary train by crafting a custom print with miniature versions of the character scattered across it. So far, the design is manufactured on a button-down shirt with chest patch pockets. Pricey? Perhaps. Worth it? Without a doubt. Although this collection is of a smaller scale, the “Disney Mickey Mouse x Marc Jacobs” line still has a chic, high-fashion impact. To celebrate the character’s 90th birthday, the design house created an oversized hoodie, denim mini skirt, denim jacket, and loose-fit dress which look as if the inverted Mickey was artfully collaged on to them. Versatility was the key intention when Jacobs created the collection, as most of the line’s pieces can be worn with a variety of others. It’s not just fashion that Mickey is making a mark on...sweet shop Sugarfina was inspired by the character’s anniversary as well. Mickey may be all about hot diggidy dogs, but Sugarfina just released a “Disney Mickey The True Original x Sugarfina Collection” with candy cubes and chocolate bars inspired by the character. There are strawberry-flavored Mickey Ears, birthday-cake flavored Mickey gloves, and berry-flavored Mickey button candies for sale on their website and at their stores. Additionally, wrapped in original Mickey illustrations are dark, milk, and white chocolate bars made from special Parisian chocolate. Sugarfina even released its first-ever 3-D diorama Candy Bento Box shaped like a vintage TV set with drawings of Mickey on it, which houses each of the collection’s candies packaged in lucite cubes. In the words of Mickey Mouse, “If you dream it you can do it.” With these brands’ new collections inspired by his long-lasting legacy, it looks like their Disney dreams certainly came to fruition.